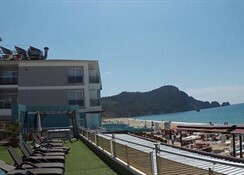 This hotel's location on Cleopatra Beach offers superb views of the sea and the rocky promontory with Alanya Castle at its peak. 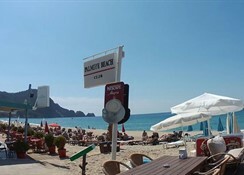 Restaurants, bars and shops are all within close proximity, while the centre is 1.5 km from the property. Alanya Gazipasa Airport is approximately 43 km and Antalya Airport some 126 km away. Refurbished in 2009, the hotel consists of 64 rooms in total and has an envious location right on the beach. Facilities include a restaurant with indoor and outdoor seating, a bar and free parking. 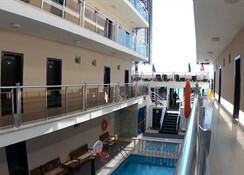 The standard rooms offer comfortable accommodation and are equipped with a balcony or terrace. The hotel has table tennis and a snooker table and provides occasional evening entertainment. Furthermore, there is a small outdoor swimming pool with children's section. 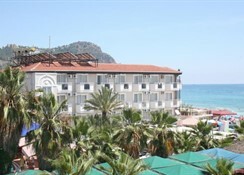 Note: The internet in rooms will be locally payable at PALMIYE BEACH HOTEL ALANYA.